Here is the second episode of The Plate Meeting, a LF Umpire Podcast from Close Call Sports, where we talk umpiring with umpires. In episode 2, Tmac and Gil are joined by 32-year major league and World Series umpire and Crew Chief Dale Scott, who retired from MLB ahead of the 2018 season. In this episode, Dale talks about his journey to the big leagues, tells some stories of a few notable events along the way, and answers your questions about his umpiring career. 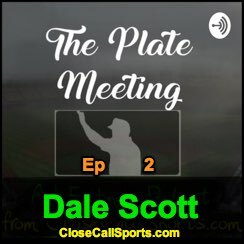 Click the below "play" button to hear Episode 2 - Dale Scott, or visit the show online at https://anchor.fm/the-plate-meeting to subscribe. The Plate Meeting is also available through the iTunes store's podcasts section (The Plate Meeting on iTunes), Google Podcasts, TuneIn, and other podcast providers listed on the Anchor.fm page. The following section contains relevant links, footnotes, or additional commentary relative to subjects discussed on the show. Click the following links for this episode to access the relevant videos. Related Video #1 (21:30): Derek Jeter's fly to deep right field is ruled a HR in the 1996 ALCS. Related Video #2 (39:00): Billy Martin's last ejection after Rick Reed's play at second base. Related Post (1:05:00): Dale Scott Comes Out as Gay After Feature Article (12/2/14). Related Video #3 (1:21:00): Russell Martin's throw hits Shin-Soo Choo's bat. Related Post: Carefree Throw, Extended Bat, and Blue Jays Protest (10/14/15). Related Post: MLB Ejection P-2|3: Carapazza, Scott (5, 2; Saunders, Buehrle) (10/14/15). Related Video #4 (1:33:30): Bautista and Odor start a fight in the Texas middle infield. Related Post: MLB Ejections 040-047 - Scott & Iassogna (TOR-TEX Fight) (5/15/16). Related Video #5 (1:42:00): Overturned call on catch/trap in the outfield leads to Fredi's ejection. Related Video #6 (2:05:30): Dale Scott's unique strike three mechanic (and an ejection to boot).